It's spring time, pastels galore for your wedding color palette! There's no better way to show off your choice of color than that best girl squad, your bridesmaids. If you're a bride, keep up with the latest trends, shades of green should definitely be on your mind. eDressit Mint tea length prom dresses give the perfect touch of color to your parties regardless of the season. A mint bridal party is refreshingly springy, while deeper shades of sage make an earthy statement for a fall wedding. Whether you're planning a rustic wedding with a mountainous tree-trimmed backdrop, a beach wedding against the waves, or a preppy wedding filled with classic touches, mint bridesmaid dresses are versatile enough to compliment any wedding style. We offer an affordable selection of wedding guest dresses and cocktail dresses. 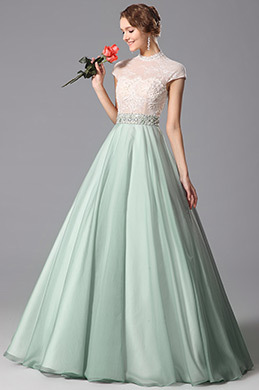 Whether you need one size to fit all or are looking for a variety of sizes, we carry petite through Mint 2019 tea length prom dresses to fit any silhouette.